If you’ve ever listened to any My Morning Jacket album you may have wondered where all that diverse musical inspiration originates from. A singular source or more of a collective effort from all band members? This album- perhaps – suggestively answers that question as MMJ’s bearded-frontman perfectly fuses prodigious sounds of classical, alternative rock, folk, funk, soul and jazz into a singular cohesion of climatic musical joy. Just like many MMJ albums have done. The piano-lead opener, “State of the Art (A.E.I.O.U)” emanates James’ curiosity of life and his ability to harmonize vowels to a progressive funky bass rhythm. The album’s first single, “Know Til Now,” is a trippy 6+ minute jam who’s random arrangement reminisces MMJ’s “Touch Me I’m Going to Scream Pt.2” and is equally contagious to all the senses. There’s also the sensual crooning on “A New Life” which starts one way and ends another way, the smooth and sultry progression of “Actress” and the uplifting instrumental “Exploding” which provides depth. Any song on this album – to the untrained ear – could easily be mistaken as a new MMJ song. And although that’s not really the case, it was, however, crafted by the one musical wizard behind all of them. There’s a lot going on these days in the life of My Morning Jacket bassist Two-Tone Tommy Blankenship. When you’re a member of one of the music industry’s most popular live alternative rock-n-roll bands, you tend to not have too much time for things other than music and your career. With MMJ’s focus on curating Louisville’s Forecastle Festival, the boys are looking at music with a different focus; through their Louisville-lenses, so to speak, more so than other shows they play. It’s hard to believe that back in 2002 Forecastle Festival started as a small group of local musicians who gathered in Louisville’s Tyler Park for one day of music and community celebration. Now, 10 years later, founder JK McKnight has morphed that little neighborhood gathering into the Midwest’s largest music, art and activism mecca, and now has tapped the area’s biggest musical export in My Morning Jacket not only headlining, but helping plan the event. Last summer’s “Halfway to Forecastle” event was a show that McKnight conceived on-the-fly to merely hold over the Forecastle faithful while he formed a partnership with AC Entertainment, the company that just happens to produce a little festival in southern Tennessee called Bonnaroo. “The partnership has been great. AC Entertainment has brought of wealth of knowledge, experience, enthusiasm, and commitment to programming excellence. Everyday is a new adventure, and I’m really glad to be part of the team,” McKnight said. So with his big guns a blazin’, and a hell of a lot more production power behind him, McKnight has now recruited Louisville’s biggest musical export, and Bonnaroo-four-hour-marathon-set-festival-favorite, My Morning Jacket, to help select the show’s artist roster and a few other details. So, I’m here with Two-Tone Tommy Blankenship of My Morning Jacket, who is one of the official curators of the Forecastle Festival. Right, Tommy? So what does that entail doing? What are you doing to building Forecastle to what it’s going to be? I think the biggest thing was throwing out names of bands, kinda like our dream list of some of the artists we wanted to see this year. As well helping plan a lot of the charities and who was going to be involved with charities. The food vendors, retail vendors. All of it was just kind of just suggestions as you know with the curation. So does that mean we will see a lot of local Louisville businesses and local Kentucky and Louisville-based bands on the bill? Exactly. Yeah, we wanted to really focus on – since there are so many national acts that are already coming in – was to have a dedicated local stage that would really shine a spotlight on what makes the city so special. Especially just having both – the festival as a 10-year anniversary and it felt like something we’ve always wanted to do at all of our shows. Like have the local village, you know? Like have the spotlight on the city itself, because there are so many people traveling in from out of town. Just trying to put the spotlight on everything we love about the city. Of course Forecastle has a reputation for already doing that. That being said though, who are some of the artists you guys hand-picked and are really looking forward to seeing? Who are some of the artists that you guys hand-picked that are like local and independent who are trying to make their way and this show is going to be a big effort for them to do that? A big one for me is Cabin. I don’t know, do you remember Shane Thomas that we went to school with? Yeah, I think so. And I’ve seen Cabin before, and they were good! Yeah, yeah, they’re amazing. Yeah Cabin, Lydia Burrell, John that used to play in the band (MMJ) is in Ravenna Colt now and they’re playing. Yeah, yeah I know The Ravenna Colt, and they’re good. Yeah, they’re amazing. Wax Fang. I mean like pretty much everybody that was invited was pretty much on our list. Like, a lot of the local artists that are coming in. In terms of your guy’s own performance, on that Saturday night is when you’re playing, is that correct? So, I’m not going to ask you for details or anything, but is there any surprises coming? A simple yes or no will do. Awesome. And – without giving it away – what can we expect? Good to know. Something to look forward to. Awesome. What would you say is your favorite thing about Louisville and our whole Kentucky-music stomping ground is or what is your favorite thing about our city? I think – and this might seem like a limitation in a way – what I always loved about growing up in the area, and what I still love about it, is that is has an identity all on its own. I think that it really pushes young artists to find their own voice and their own sound, and really make things happen. Because it really isn’t a destination scene. It isn’t like you said, Chicago or any of the big cities that are around. Or even Indy in a way. It just doesn’t have that…like people aren’t moving to Louisville to start bands. Yeah, you’re saying that we’re a very homegrown music scene. Yeah, for sure. It’s kind of insular. I think they’re aren’t a lot of opportunities to play outside of the city; it’s not like if you make a name for yourself in Louisville that will carry you through a bunch of other cities or, you know, get you on a bunch of other cities and festivals and stuff. Right, right. So what’s your advice to young musicians here in town who are trying to get where you guys are going with your own career? I mean, it’s gonna sound kind of clichéd, but as long you just put the work into it, you know, more than anything else. I mean obviously, it’s just passion. It’s having the passion, putting the work into it and not expecting a whole lot in return. Like work and work and work, and don’t expect a whole lot, and then I think you’ll have the biggest reward that way. So, circling back to you guys. Jim (James) just recently announced that he was doing a solo project, which is pretty cool, and of course Carl (Broemel) has done his own thing. Do you think that all the side project work that other members do will contribute to a MMJ hiatus? Yeah, man I feel like this is the main gig for all of us. And being able to have the freedom in the band to go and do these other projects – it’s like when you come back to it – for all of us, we have this deeper appreciation for our dynamic, the way we work, how easy it is. And then you’re learning something when you walk away from the band who is been in these other playgrounds, these other sandboxes. You get to experience things with other people; then you can kind of bring that experience back with you into this familiar family setting. So it’s definitely something that fuels your diversity because from one album to the next you guys are never the same. (laughing) Right, right, yeah. Yeah. That’s good. So it’s turned into a positive and not a negative is what you’re saying? Awesome. Do you have any side projects or solo things you’re planning on your own? Ummmm, nothing so far. No, no. (laughing) Exactly, right. Life is good. So, let me ask you this, closing out here; you guys have been nominated for a Grammy on several occasions. How important is it for you personally or as a band to eventually bring one home? Ah, for me, you know, just being nominated is mind blowing and it’s unbelievable. It’s such a rewarding feeling, that whether we win or lose, to have that recognition to have the nomination is way more than I could have ever dreamed or hoped for. That’s good. So, what’s next for My Morning Jacket? After this tour and after Forecastle Festival, is there a new album in the works? Nah, you know, we’re just focusing on touring for the rest of the year and then hopefully come next spring we’ll start getting into song-writing and studio work. Forcastle Festival 2012 lineup announced and you can check out my preview in the July 2012 issue of Performer Magazine. Check back here in July for my official preview that will be featured in the July 2012 issue of Performer Magazine. The Forecastle Festival – Louisville’s nautically-themed summertime celebration of music, art, and environmental activism – has announced that My Morning Jacket will headline and assist in curating the festival’s tenth anniversary. The 3-day event will take place July 13 – 15, 2012, at Louisville’s scenic, award-winning Waterfront Park. My Morning Jacket, whose original members hail from Louisville and currently reside in the city, will headline Saturday night, as well as collaborate with producers on the sights, sounds and experiences of the entire festival weekend. Celebrating its 10th year, the festival will pay homage to its past, present, and future, highlighting Forecastle’s maritime theme while celebrating the very best of Louisville and Kentucky. Full festival details, including the complete line up of headliners, along with over 75 bands performing on multiple stages, will be announced in the coming weeks. Separately ticketed late-night after-parties will also take place on the historical steamboat, the Belle of Louisville and at the newly renovated Ice House. Specially priced weekend passes will go on-sale January 27 at noon (EST). After the initial allotment is depleted, tickets will still be available at regular price. Travel packages will also be available, including accommodations at The Galt House – the festival’s official, waterfront hotel. For those who wish to dock up for the weekend, VIP “Captain’s Club” boat slips will also be available. For ticketing information, visit www.forecastlefest.com. 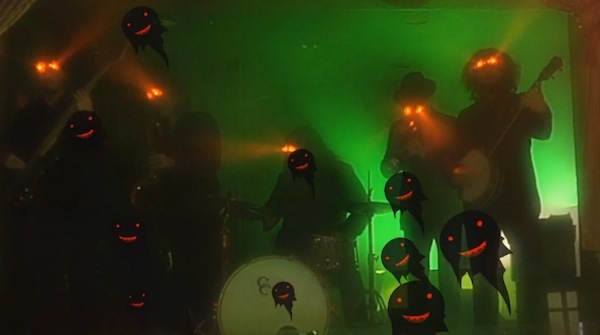 My Morning Jacket has debuted a new eye-popping, euphoric video for “Holdin On To Black Metal.” The guys gave an early preview of the video on Monday night when several members posted it on their Google+ accounts, resulting in one of the first music video premieres shared within Google’s new social network. Two Kentucky musicians, Louisville’s My Morning Jacket and Edmonton’s Black Stone Cherry both debuted their latest albums on May 31. Now, both these Kentucky rockers are realizing some of their highest Billboard 200 chart successes to date. MMJ’s Circuital checked in at #5, just above two Nashville country puppets (whew!) and just below Eddie Vedder’s Ukulele Songs. BSC’s Between the Devil and the Deep Blue Sea clocked in at #29, just above the Foo Fighters’ Wasting Light (at #32), I might add. MMJ continues to stay in the limelight in virtually every viewable media and every huge music festival. Since they launched Circuital, they’ve also debuted a Vh1 Storytellers episode, and played on the Jimmy Fallon show. Right now they are gearing up for their Bonnaroo performance, and even managing to pitch in and play a benefit concert for the Tuscaloosa tornado victims. Nice Kentucky boys they are, right? BSC is currently on tour in Europe. They’re headed back to the U.S. in July, and will make a Friday, August 26th Kentucky State Fair gig in Louisville, as part of the Carnival of Madness Tour. I’m anticipating it will be in Cardinal Stadium again, but more to come on exact location in the fair. So, if you haven’t bought a copy of Circuital or BTD&TDBS yet, then get out there and get your hands on a copy or logon to iTunes. Let’s see how far we can help export these Kentucky boys. Videos and album artwork courtesy of Roadrunner Records for BSC, & ATO Records for MMJ.